After watching the DVD on Making Traditional Side Escapement Planes, I decided that making a couple of plane floats sounded like a fun project. 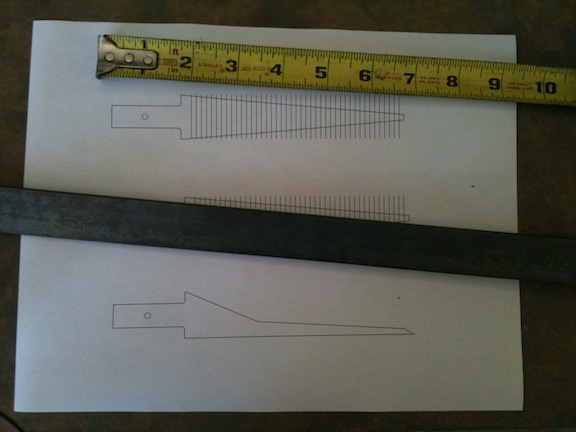 I started by doing a layout in SolidWorks and printing out full scale drawings of two floats and a chisel. 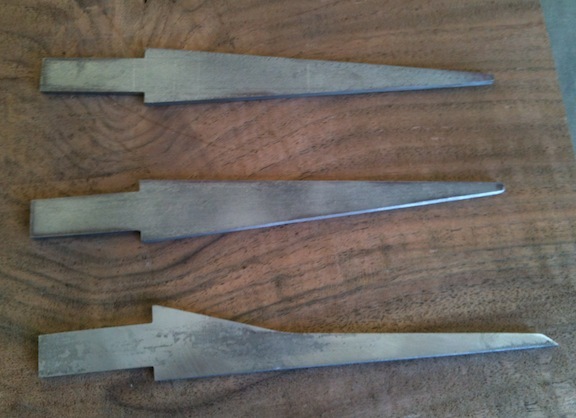 My thinking is that I’ll make one edge float, one side float and a matching thin chisel. The only harden-able steel I had on hand in an appropriate size was some 1095 high carbon hot rolled bar stock left over from a damascus knife forging project. If I was buying material I’d probably order some precision ground O1, but this should work just fine. It’s 1/8″ thick by 1″ wide. In laying out the floats I used an included angle of 10 degrees. 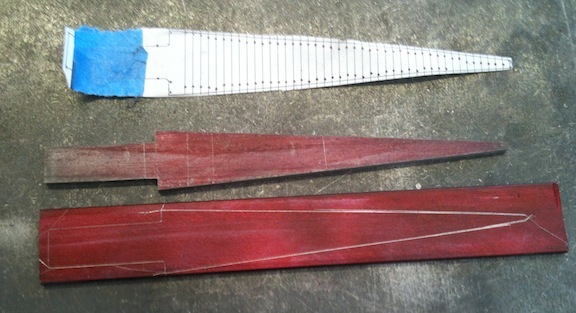 The angle difference between the bed and breast on this style plane seems to be 10.5 to 12 degrees. Larry Williams used 10.5 degrees, so a 10 degree float should cover it. The length of the working area was dictated by the angle and the width of the stock…and the fact that I wanted the overall shape of the tool to flow continuously from the tip through the handle. The layout lines for the teeth are based on 9 teeth per inch. I cut off three 7″ lengths of the bar stock, bead blasted the mill finish off and painted them with red Dykem layout fluid. Then I taped the pattern to one of the blanks and used a snap punch to transfer the key layout points. I prefer the red Dykem over the blue, I think it shows lines clearer, and if I cut myself it’s not as noticeable on the part. Then I removed the pattern and used a scribe to connect the dots to layout the outline of the float shape. You could cut this out on a metal cutting bandsaw, with a hacksaw or using a cutoff wheel in a die grinder. Or maybe a metal cutting blade in a saber saw. I just used my belt grinder with a 50 grit belt to profile them. It was faster than changing the blade in my bandsaw, which would have been how I’d do this normally. I kept a pan of water handy so I could keep the part cool. After I’d ground the part to shape I used a file to tune up the inside corners by the tang, then traced in onto another blank to make a second float blank. Lather, rinse, repeat and you have two float blanks. I also laid out the chisel and ground it to shape. That’s as far as I got yesterday. Today I hope to file the teeth into the float first. 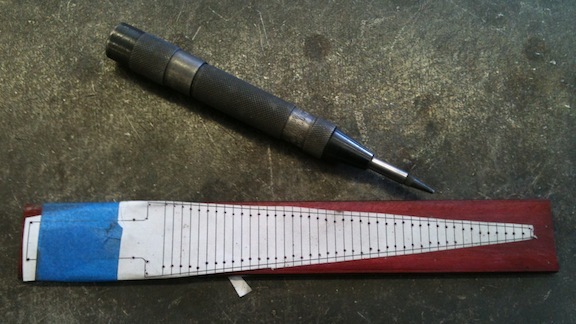 I’ll also grind the thickness of the chisel down to 1/10″. It’s .124″ currently, I think I can remove about .010″ from both faces on the belt grinder with the 50 grit belt, then lap the sides smooth with 80 and 120 grit. Cooking pretty good here. The design continuity is pretty nice also.